#Friday in the #Art #Studio. Week one #Done. #ThankYou for #Subscribing. “Shallow understanding from people of good will is more frustrating than absolute misunderstanding from people of ill will.” – Martin Luther King, Jr.
AP Studio Art – Art and Fear – Make your ART! Your reach as a maker is still pretty far… who do you reach? Last day in class to work on this breadth piece. How has it felt to be NOT working on your CONCENTRATION works this week? Give yourself a few sentences to reflect. What are you going to be working on this weekend to resolve your work. PLEASE WRITE UP AND POST A ONE PARAGRAPH STATEMENT ABOUT YOUR ARTWORK ON THE WEBSITE – IN YOUR CHAPTER PAGE. Advanced Drawing: Let’s pin up our Abstraction and Pastels and talk – MONDAY! Crit? Let’s look at this on MONDAY! What do you need to do in order to get this drawing completed? What has previous discussion of your work tended to be? Negative? Positive? Constructive? Discuss the challenges that one might face when posed with the potential of a critique. What do you fear about the idea of speaking to your classmates about their work? If you had to choose ONE element or one PRINCIPLE to focus on about your artwork, what would that be and why? Drawing: Still Life -Time to draw the FINAL WORK! 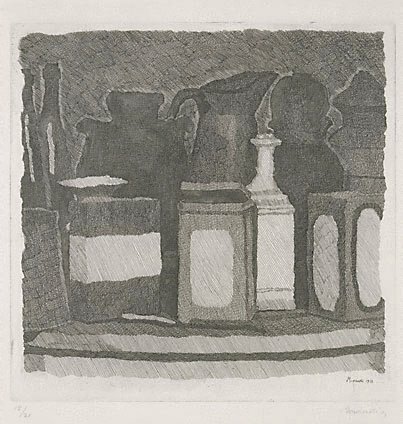 Morandi’s prints. Look at the RELATIONSHIPS in space and form. Impressive! G: 2.1Ac: Through experimentation, practice, and persistence, demonstrate acquisition of skills and knowledge in a chosen art form. What did you accomplished yesterday? What are the differences in drawing materials – in your own words? Regarding the work by Georgio Morandi, what are 3 things that you see in his work that you could carry into the work you are creating? What are 2 challenges you are facing? What is ONE thing you are happy about? Studio Art 360: Construction Time! 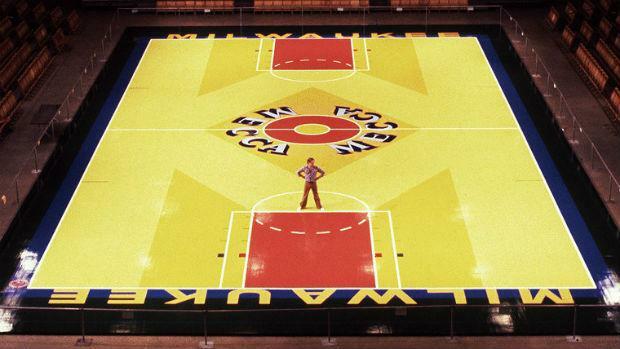 Robert Indiana’s famous MECCA Arena Floor for the Milwaukee Bucks. Watch this WTMJ’s Story about Robert Indiana and his work! What is the difference between shape and form? Please be descriptive in your definition that you come up with your neighbor. What do you envision as the biggest challenge with your forms? If you see this as the problem… how do you feel you might be able to solve that challenge? Previous PostPrevious How can it be #Thursday in the #Art #Studio already?